Stop in any time we’re open, and create something you’ll be excited to take home. Stop in any time we’re open, by yourself or with friends, and we’ll ensure you have a great time – and create something you’ll be excited to take home. 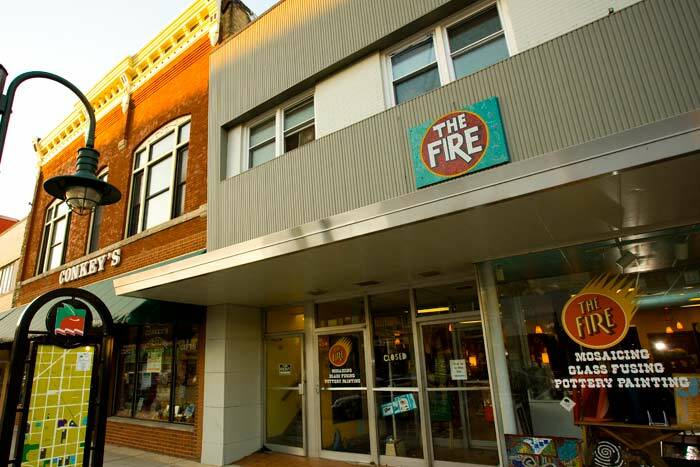 No appointments are necessary (but if you have a group of five or more, give us a call and we’ll make sure we save room for you).When you walk into The Fire, you’ll be surrounded by many options – and some great, inspiring samples of what you could create. Don’t feel intimidated. All of our staff members relish the opportunity to help customers create something incredible, and they’ve been chosen for their enthusiasm, creativity, patience, and ability to explain things in a simple way. You can choose from four types of projects: pottery painting, mosaic, glass fusing & precious metal clay. Choose from a wide variety of pottery items, from sushi plates and serving platters to tons of fun kid items and picture frames. We’ll help you gather a palette of paints from our large selection, so you can create any image you desire. Then, we’ll fire your pottery, and you can pick it up about seven days later. Mosaic is much easier than the stunning results might make you think. You simply choose an item to mosaic (anything from photo frames and candle holders to wall décor and mirrors) and glue small pieces of glass onto it. We have an excellent variety of colors available, as well as embellishments. Then, you can choose to take a free grout package home to finish it yourself, stop back in a day or so to finish your project, or ask us to grout it for you for an additional 25% of the cost of the mosaic. Glass-fused items are incredible, but they are surprisingly easy to make. (Don’t worry. We won’t tell anyone if you’re making a gift.) You start with a flat piece of glass – small if you’re doing a pendant or large if you’re making a dish – and then glue additional pieces of glass on top. You can choose colors and shapes, from thin lines to large squares or circles. When you’re done, we’ll fuse the pieces together. If you’re making a bowl or serving platter, we’ll shape your fused item using a mold. We even offer photo fusing, which incorporates photographs into your artwork. What grandparent or parent wouldn’t love that gift? Items take a while to fuse & cool safely, so you can expect your finished piece to be ready in about seven days. Want to make a unique piece of silver jewelry for yourself or for a gift? Precious metal clay is an easy and fun choice. You can make necklaces, bracelets, earrings, or charms using a variety of molds, and you can personalize them with letters, or your own sketches. Our precious metal jewelry is non-toxic and made from 100% recycled silver. And unlike sterling silver, which is usually mixed with another metal like copper, this material is 99.9% pure silver mixed with an organic binder. Questions about how it all works? Don’t worry: We’re happy to help. Stop in and we’ll show you around. 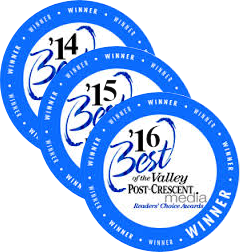 Best of the Valley 2014-2016!